ROME (AP) — The Arctic storm dubbed the “Beast from the East” saw temperatures across much of Europe fall Monday to their lowest level this winter and even brought a rare snowstorm to Rome, paralyzing the city and giving its residents the chance to ski, sled and build snowmen in its famous parks and piazzas. 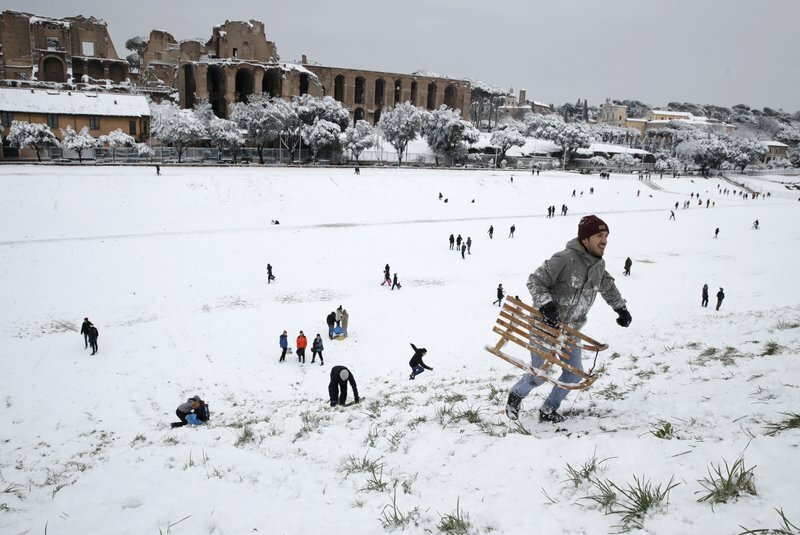 Rome’s schools were ordered closed, while train, plane and bus services were crippled. Italy’s civil protection agency even mobilized the army to help clear slush-covered streets as a city used to mild winters was covered by a thick blanket of snow. Elsewhere in Europe, the storm set dangerously low temperatures: Lithuanian officials said temperatures that plunged to as low as minus 24 degrees Celsius (minus 11 Fahrenheit) in some places were to blame for the deaths of at least three people over the weekend. Hospitals in Lithuania and Latvia have reported an uptick in people being treated for hypothermia and frostbite. Swedish Prime Minister Stefan Lofven’s car skidded off the road in a snowstorm north of Stockholm and smashed into railing, one of several snow-related traffic accidents in Sweden. He was uninjured. Meteorologists in Germany, meanwhile, reported a record low for this winter of -27 C (-16.6 F) on the Zugspitze mountain in the Alps. Moscow, as well, recorded its coldest night this winter, with the mercury dipping to nearly -20 C (-4 F) on Sunday night. The intense winter weather has been dubbed “The Beast from the East” by British tabloids, citing the Siberian Arctic as the source of the frigid temperatures. The storm system has moved progressively south and west and is expected to bring continued cold and snow for several days over much of Europe. While unusual, the U.N. weather agency says such late winter cold spells aren’t exceptional. Scientists say the big chill in Europe is partly caused by the fact that strong winds which normally keep cold air ‘locked’ over the Arctic have weakened, releasing icy blasts across the northern hemisphere. Similar sudden drops in temperature have occurred over North America in recent years and climate researchers say they could become more frequent as global warming further saps strength from the air currents around the pole. Even as Europe shivers, temperatures in the Arctic itself have been unusually warm in recent weeks, the World Meteorological Organization said. The Cape Morris Jesup station on Greenland’s northern tip recorded temperatures above freezing several times since mid-February.